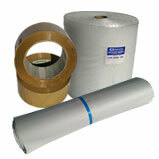 We carry more than just moving boxes and packing boxes at Enmore Box we have an extensive range of packaging supplies and can source most other packaging requirements for our customers. If you are looking packing boxes or boxes for moving, check out our moving house page. If you are looking for boxes for sale or cardboard boxes, have a look at our second hand box list. All popular products are available in stock for immediate delivery. All Prices are subject to GST @ 10%.